left to gaze at this world unknown. 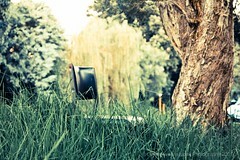 Like the image every person that sets foot into a new place is lost. It takes time before they can find a comfort zone where they are settled and accept the new reality and situation they are in there by coming to appreciate this new life. However not many find in and remain to sand out, and they patiently wait till they find that place. 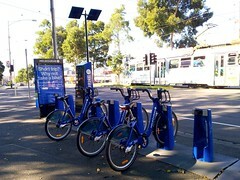 Melbourne has its momentous public transport system; Tram is its famous one and accessible bicycles on the roads for the public. “Short Trip? Why don’t you take a bike?” That sentence attracted me at the first glance. 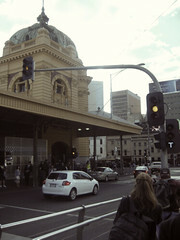 This photo was taken at the corner of Vic Market and William Street, with Tram 55 and bicycle stands. 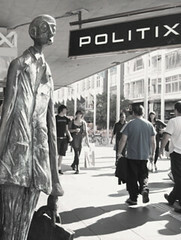 Melbourne – a thriving corporate hub and the heart of Victorian politics. This city is far from black and white. 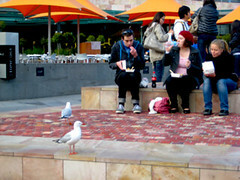 Going around Melbourne, you can see many kinds of bird flying everywhere. 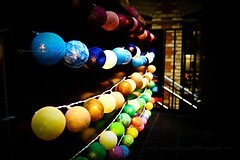 They’re so colourful, friendly and diversified, just like the multi-culture environment in Melbourne. Thinking about the next move! 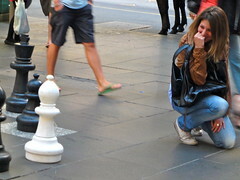 This photo shows the curious performances you can see in Melbourne, a touristic city where people enjoy laid-back life-style. 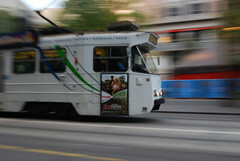 Yarra Trams – very much a part of the Melbourne community. It is frustratingly slow when in a hurry yet “2 x faster” when you race to catch it. 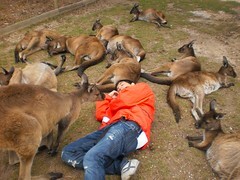 The photo depicts Australian people’s laid-back attitude to life. 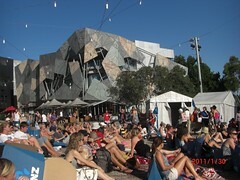 People have taken time out to relax and watch the tennis under the blue skies in summer. This picture was captured not really in autumn, but more likely at the time when the trees are colouring their leaves in yellow. 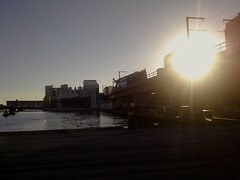 At this time, autumn comes asking for summer for her residence in Melbourne. 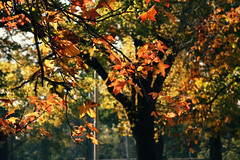 And Melbourne in Autumn, what else can be more romantic? 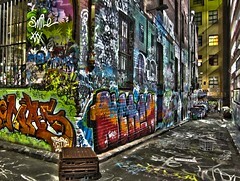 This is an alleyway in the City of Melbourne. 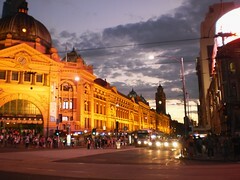 It is remarkable how such a place exists amidst a commercial area such as Bourke Street. 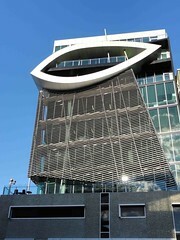 People use it as a “diversion” from the busy surroundings and appreciate the mood it creates. 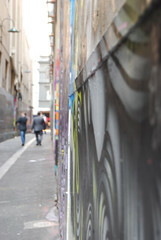 These alleyways emanate a sense of place and provide an opportunity for people of this community to express themselves and thereby artistically capture the pulsating spirit of Melbourne. Hello! Please take the picture with me! 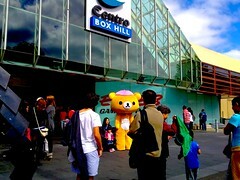 A lovely bear attracts many people to take a photo with him, by showing some kind of performance. It aims not only to attract people to take photo with him but is also a kind of marketing for the shopping centre in weekends. A pleasuring sight, a fresh and stunning feeling! Oh, Everything is big in Australia! Well, it surely is the edible vege showing somewhere at the Swanston street. 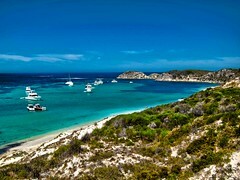 The most wonderful thing I have ever noticed in here is almost everything is big, in Australia everything is huge. 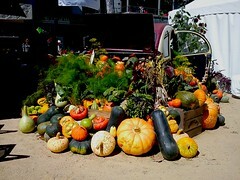 Especially fruit and vegetable, they are not only tasteful but also very big. We love the people here and the things they grow! Although Melbourne is a big city with lots of cars and a little bit slow flows of traffic during peak hours, it is still much more peaceful than many big cities I used to visit. 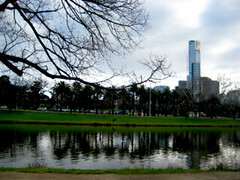 It is a green city with lots of trees, lakes and rivers. Many people love walking in this wonderful environment . It’s really wonderful to be there! The photo represents the idea of coming to a new land, conquering it in a way. 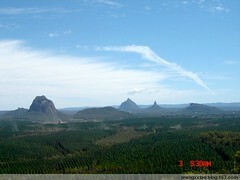 It is clear that we are referring to Australia due to the red land and the nature that can be seen in the background. 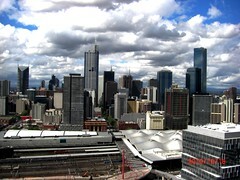 The view highlights the shapes of the vertical and horizontal buildings and infrastructure under clouds that are threatening to burst with rain. 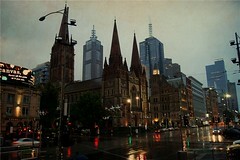 This photo was taken from Flinders Station to capture Melbourne’s mixture of old and modern architecture in the soft light of light rain. 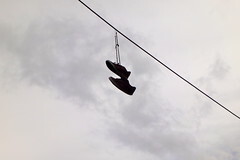 Last time I came down the laneway, there was a business man and a homeless man smoking a cigar. 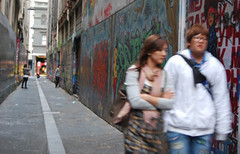 Laneways in Melbourne are usual by a diverse group and full of colour. Travelling around Melbourne, you can feel different features of her. You can enjoy a peaceful feeling while walking along lakes or visiting some parks. In the other hand, you can feel a dynamic atmosphere while walking around shopping centres or passing some premium stations. 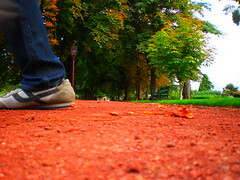 When I first came, I was very impressed that people walked so fast here! ‘Come on, mates. 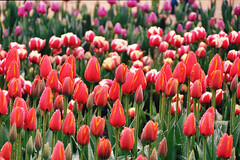 Be quick!’ Dynamic – it’s a good lesson for the youth, including young students. Lunch break, one hour; No study, no sports, no desire for “human conversation”. 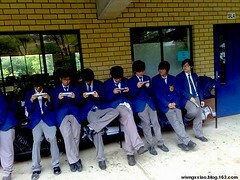 All that’s left for them was PSP, until they were bored with that too. 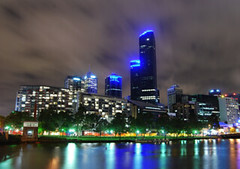 Against the backdrop of the overpowering grey, the Melbourne skyline stands serene and radiates a lively blue aura. The multicoloured reflections blend into the tranquil lake just like the many cultures that merge to form this vibrant and peaceful city. 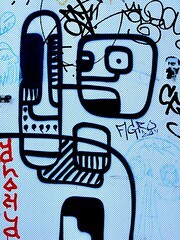 The first thing that hit me when I went into the city of Melbourne was the freedom of expression. 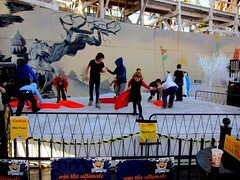 I was amazed to see the way people freely expressed themselves, and how not everyone shunned them for it. I noticed expression is a way of life here and people feed on it. For me it was something new, sometimes it is refreshing and sometimes it’s overpowering. It makes you understand how different and unique people really are. Australia is a country with big land, and few people. Out the city, into the mountain area, the beauty of its natural landscape unfolds before us: sky, cloud, mountains, and trees in different green…extend your vision and let your imagination fly. It’s a luxury to have this kind of view back in lots of cities of China where industrial wastes have engulfed everything. 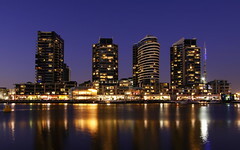 Melbourne is a fairly young city in Australia and fortunately it is beautifully structured with buildings running along the deck, furnished with elegant cafes and restaurants. A Friday night sitting with friends, enjoy your stake and wine with the water reflecting colourful lights is just perfect! Up high where the air is clear. Up high where my mind is free. Up high where I see a different horizon. Up high I see the beauty that was beyond me. Some times it takes a different perspective for you to see this clearly and appreciate the beauty. 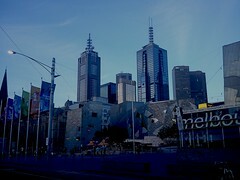 Coming to Melbourne I have come to appreciate my county and city a lot better. It have given me a broader perspective on how the word is and has thought me to be gratefully for what I’m so lucky to have. What a big crowd waiting for next performance! 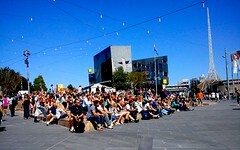 A large crowd of people is waiting for the next show of street performer at the federation square. The performer does not appear in this scene but I am sure you can tell his performance is really good enough to attract this crowd by looking at the crowd dynamics in this picture. 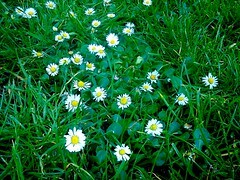 Flowers blossom even in green green grass! I was walking through the Lincoln square on the way back to my home, then I found out these little white flowers blossom in the green grasses. 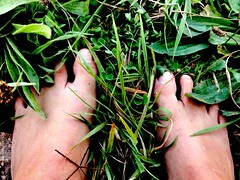 A thought was pop up in my mind: Flowers blossom everywhere even in this green green grass. Well, it was definitely the Spring season in Melbourne. This photo is taken at a Sunday market in a small town just outside Brisbane. It’s noon time; the weather was hot, but with a gentle breeze, perfect for a nap. 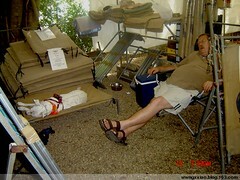 The sign said: “Take whatever you like; just don’t bother me and my dog.” Australians are happy, relaxed and enjoying their life at any second. A Great City Scene just after sunset! When I was waiting the tram in front of the Flinders street station, I could not resist taking a shot of this scene of city under the residual sunlight! Nothing fills the streets like we do! 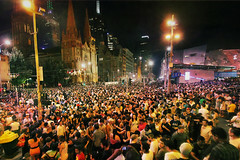 It was the night of new year’s Eve and Flinders Street was never like it was before, no tram, no cars, no horses riding, just filled with family, friends, brothers and sisters. And we, so alike, all hope for a year of joy and happiness, and also, for each other. Well done. A great set of creative photos that represent impressions of Melbourne, its diversity, its connections and its ways of life. Fascinating focus on the familar often overlooked. 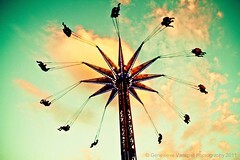 A wonderful group of photos to reawaken our senses. Thank you.